I’ve been writing and recording some of my memoir pieces and, in what some might call an extraordinary bout of egomania, posting them on SoundCloud and iTunes. It’s my way of marking my territory, tagging a wall, or like Kiljoy of yesteryear simply saying I was here. This story is part of a series about a trip to France I took with my younger sister in 1973. Thanks for listening, subscribing, and if you're feeling it, leaving a comment. Clean from our bath in the sea, awake and running on adrenaline, my sister and I hit the town in search of someplace to stay. 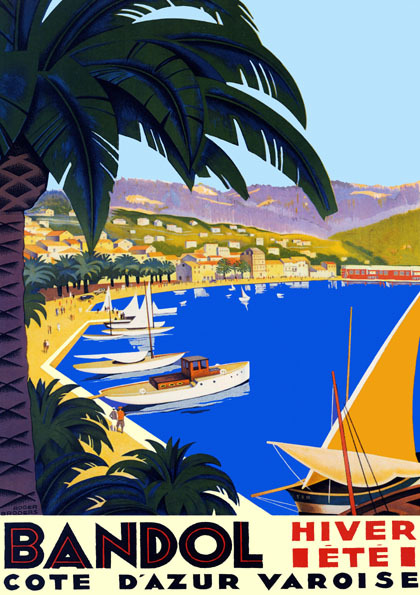 Even back in 1973, the hotels overlooking the beach at Bandol, with their pea gravel patios set with painted wooden tables and colored umbrellas, were too pricey; even I didn't have to ask to know that, so we headed to the port side of town. Fronting the harbor, a row of shops, bars and outdoor cafes lined the road. Later when the sun dazzled, the promenade would be overrun with visitors reaching across tables for cheek to cheek kisses, lilting French tones singing out in the air. For now, in the quiet of the sun-glinty morning, the main street was subdued as restaurant owners opened their doors and swept the sidewalk, the beach birds and the slip slapping of the sea hitting the hulls of the docked boats in the background. Nancy and I found an affordable pension at the furthest end where we bid the old woman beating the welcome mat out front a polite good morning. We were learning. The name of the place—clean, small, perfectly comfortable—has long been forgotten but not the look on the owner's face that first day when we returned long after the included second meal had been served and cleared. She was furious. My rudimentary French had failed me again. My skills, not used since I'd left Canada and my eighth grade French class behind, mainly allowed me to find out the basics: the where (Ou est?) the how much (Combien?) and the time of day (Quelle heure est-il?) Nuance and subtleties such as the workings of a pension where the price included breakfast and dinner went right over my tete. While Nancy and I had picked up a couple of sandwiches on baguettes —jambon avec du beurre for me, sans for my sister, plus a large Coka—from a street vendor, we were oblivious to the preparations being made at the hotel while we were basking on the beach. While I initially thought the fact that I'd paid for the meal meant it shouldn't matter whether I ate it or not, I came to realize that other people's time and energy mattered. The potato and leek soup mattered. The potatoes peeled, the leeks chopped, it all counted. The waste meant something. I'd learned a similar lesson while visiting my grandmother and my uncle at his home in England that same summer. He was a cameraman with ITV and had a lovely home in Chorleywood but it didn't have a dishwasher. Young and thoughtless, I felt virtuous simply for offering to wash the dishes by hand. By hand! Back home in the states we had a dishwasher and I was used to rinsing and stacking mindlessly in the machine. Washing dishes in the sink wasn't something I gave much thought to except to think what a good houseguest I was being, washing the dishes, allowing my grandmother to watch the telly uninterrupted. I can still see her face, the same pinched, pained expression as the owner of that French pension, furious at my thoughtlessness. Letting the hot water run and run while I sudsed and scrubbed away. Water wasn't free, she taught me. And hot water definitely wasn't. Every drop of water from the tap was being tallied by the meter, somebody had to pay. If I was the one paying the bill, she said, I'd be more mindful of what I was doing. There's a price to pay. She was right, I was thoughtless. These days, I live in California where we're in the midst of a drought. A drought that harkens back to the dry days of the late 1970's. A devastating drought that demands we watch every drop of water. These days I often think of my grandmother as I fill the kettle with the precise quantity of water needed for two cups of tea or when I turn off the tap as I brush my teeth or leave my toilet unflushed. If it's yellow, let it mellow. If it's brown, flush it down. Today, as I toss out rotten zucchini unearthed from the bottom of my refrigerator's vegetable bin, I'll think of that French innkeeper too. Waste not, want not. Just eat it as Tom Collechio might say. There's always a price to pay. Love France? Connect with Dreaming of France where Paulita and fellow francophiles share great French memories, their favorite finds, places, restaurants and things to do. that is an important lesson to learn-where in Canada are you from? I am from Ottawa. Hey Esme; We are fellow Ontarians, lol. We lived in Niagara Falls for most of elementary school and middle school. We moved from Canada to Puerto Rico right at the start of 9th grade. It was an amazing place to grow up. How about you? What a wonderful post on so many levels. I love your stories about your youthful adventures in Europe, & I really enjoy your writing style. But this post also came with an important message for all of us today. I have been following the California water crisis & I am so awear of how much we all waste. Love how you brought your memories full circle to what we should all be remembering. Great post now! Thanks Sally! Yes, we are in dire straits here, and it just feels like so few people really care enough to change their habits. Urgggh! Oops, indeed! We were so oblivious, oui? Thnx Paulita.